Sometimes you need a spell for your HERO System character - or perhaps even a whole magic system. To make selecting and crafting your spells as quick and easy as possible, The HERO System Grimoire has just what you need: hundreds of spells suitable for any characer or campaign. Unleash the full power and potential of HERO System magic in your game! 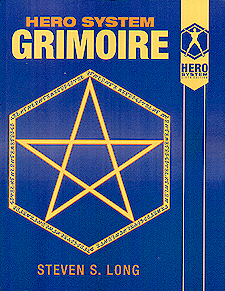 Whether your character is a mighty Fantasy wizard, a powerful superheroic mystic master, an Urban Fantasy shaman of the streets, a fiendish necromancer, or a mysterious warlock, he'll find just the spells he needs in The HERO System Grimoire!